FOR SKIPPERED CHARTERS FROM BEROWRA WATERS. This is the newest hire boat to ply the waters of Kuring-Gai Chase National Park and Hawkesbury River. The fit out is better than many recreational vessels and feed back from customers describe her as “to good to be a hire boat”. The boat is a traditional trawler style with walk around decks, it has a large saloon and huge flybridge that also offers much sought after shade to the sizeable aft deck. 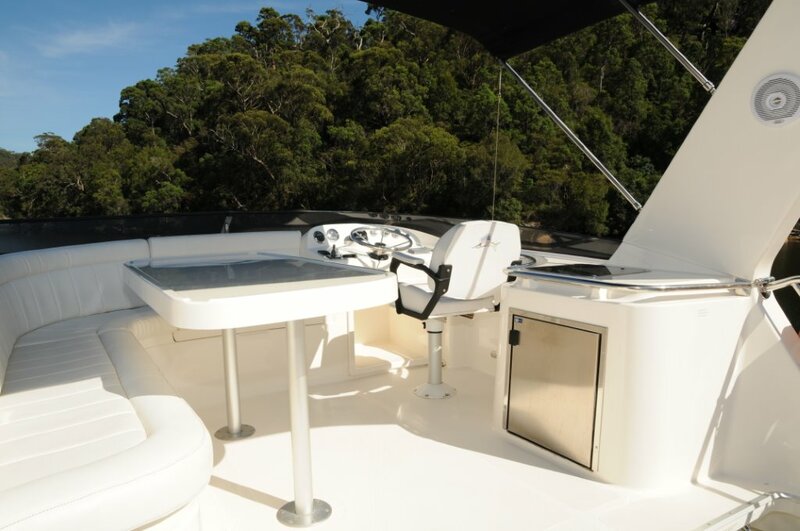 Based at Berowra Waters, Relaxation can also depart from other areas on the Hawkesbury River, and is great as a transfer taxi boat to one of the many restaurants based on the River. The flybridge is an entertainers delight, it has a BBQ, a sink and even a fridge to keep the essential refreshments cold. The table easily converts to a sunbed. 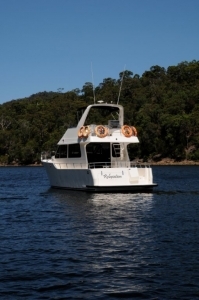 The boat can sleep 8 people comfortably, it can also accommodate 3 couples in complete privacy. A 240V inverter supplies power to each of the cabins for those customers who need to plug in a CPAP machine.